Germ cell tumors are growths that arise from reproductive cells. As such, they are usually located in the testes or ovaries, but can arise elsewhere as well. Just as there are many types of reproductive cells, there are also many types of germ cell tumors and many ways to treat them. 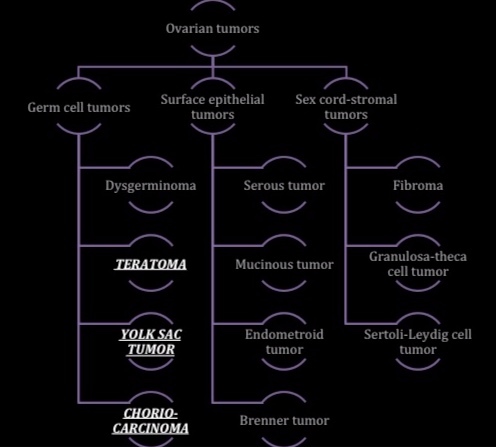 Below are schematics of ovarian and testicular tumor classifications. 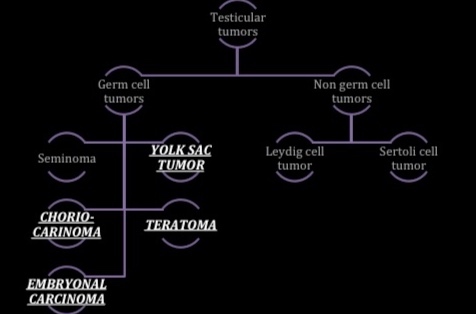 Tumor types relevant to the study covered in this post are indicated. Broadly speaking, germ cell tumors fall into two broad categories: germinomatous and nongerminomatous. 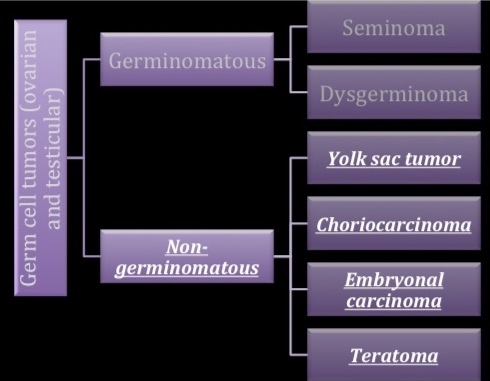 Germinomatous germ cell tumors only include germinomas (seminoma in the testis, dysgerminoma in the ovary). Nongerminomatous germ cell tumors include all other germ cell tumors, including (but not limited to) endodermal sinus tumors (also called a yolk sac tumor), embryonal carcinoma, and choriocarcinoma. The study we are looking at will focus on nongerminomatous malignant germ cell tumors. This study compared traditional imagining (CT) in surveillance of pediatric nongerminomatous germ cell tumors after treatment with surveillance via tumor markers. Tumor markers are substances in the body that are given off in much higher quantities than usual when a cancer is present. They are most frequently used in tandem with other detection methods, such as imaging or biopsy, to confirm a cancer diagnosis. There are many different types of tumor markers, as well as many limitations for their use, so they cannot be used to diagnose cancer on their own. As such, their utility is often limited to measuring response to cancer therapy or detection of relapse. Additionally, in order for an elevated tumor marker to be meaningful in detection of treatment response or relapse, that tumor marker has to be elevated at the time of diagnosis. Historically, tumor markers have been utilized in adults more often than in the pediatric population. As such, most current surveillance protocols for pediatric nongerminomatous malignant germ cell tumors utilize CT scans at fairly frequent intervals. Some studies suggest that in pediatric patient populations with low or intermediate risk for relapse, these frequent CT scans and subsequent exposure to radiation can have negative health impacts out of proportion with the risk of relapse. Additionally, young children often have to be anesthetized for such scans, which always carries some additional risk. CT scans may also be cost prohibitive to patients and their families. Finally, false positive CT results are not uncommon, resulting in undue stress and anxiety. This retrospective study looked at how well tumor markers indicated relapse as compared to CT scans. Most patients who relapsed after initial treatment had both elevated tumor markers and abnormal imaging. However, some patients had abnormal tumor markers with normal imaging, and a small number of patients had normal tumor makers with abnormal imaging (although it was later reported that most of these patients indeed did have abnormal tumor markers at the time of imaging). All of these patients were ultimately determined to have relapsed and were subsequently treated. These data could indicate that tumor markers have a higher sensitivity than CT, and they could therefore detect relapse better and faster than traditional imaging methods. Especially with our pediatric populations, there is value in treating cancers quickly and aggressively. When we consider pediatric oncology, it must be looked at from more than a disease standpoint. Pediatric cancer is a family affair, so any attempt to decrease stress and burden (financial or otherwise) and increase quality of life is welcome. A tumor marker test, if equal to or more effective than a CT scan, could be a productive step in this direction. The patients in this study utilized both CT and tumor markers for their relapse diagnosis. While most cases were positive for both CT and tumor markers, the data reveal cases where one modality was positive while the other was negative. Until a more robust study can show that the potential for a false negative is insignificant, it adds risk to engage with only the modality of the tumor marker without imaging. Furthermore, while it may be available elsewhere, no data showed the prevalence of elevated tumor markers in either the general pediatric population nor those pediatric patients previously treated for germ cell tumors but currently with no evidence of disease. Future studies should continue to evaluate the efficacy of the specific tumor markers looked at in this paper with more data to determine if eliminating CT from surveillance protocol wouldn’t increase patient risk for a false negative. Additionally, the false positive rate of CT should be compared with the false positive rate of tumor markers. Finally, analysis should be conducted to determine whether or not using both CT and tumor markers for surveillance gives the patient the best outcome when considering factors such as disease detection, cost, accessibility, quality of life, anesthesia use, and radiation exposure. Overall, this study should give us hope that maybe we can one day make cancer care and surveillance a little bit easier for our pediatric populations and their families.